likewise my car is D9 , maybe there is a fuse somewhere that i can check? airbag ecu fuse. Could that not just be poor connections on the seat wiring? Anyone? Could be. Those are all the detonators - use caution. I would look for something common to all 4 circuits - the control unit itself, it's multipole connector and it looks like there's a bunch of connectors (one for each cct) right at the front of the console or under the radio. Bear in mind this is failing the startup continuity test, which probably applies micro amperes to each "pyrotechnic device", it doesn't take much connector degradation to be seen as an open circuit. Other possibility is obviously the control unit itself. Could the OP borrow one to test from another car or liberate one from a scrapyard? I'm inclined to think it's the ECU that's faulty - maybe ingress of spilt Red Bull...? I scanned the left and right seat belt air bag.. It show no fault.. While the instrument cluter airbag and seat belt keeps blinking .. 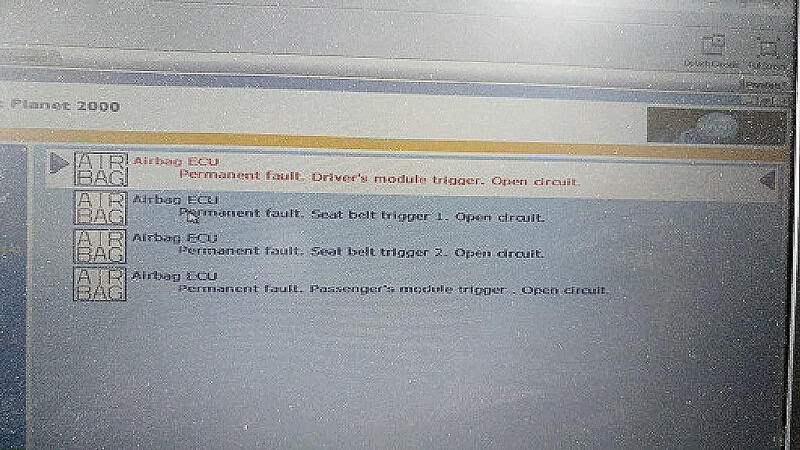 So where scanned the airbag ecu.. Then this codes appears as permanent fault..that's why am suspecting .. There is a code A0 below the arrow of the airbag ecu.. My question here is must I get airbag ecu with the code A0 to replace.. And where will I get cheap good one online? All the pretensions are not showing any faults and connections are ok..
PP2000 can disable the faulty airbags to stop the light from flashing, but this isn't a fix. If PP2000 cannot disable the airbag then there is a change the ECU needs replacing. Sorry I can't help with the numbers. is a new fault.. i will have to get a new ecu.. any links where i can get reliable used ones? Have you given all the connections on the ECU a good clean with a contact cleaner or something - worth a shot. oh yes i did that..
likewise i saw a new airbag ecu on ebay, and the guy was saying that it was uncoded, so i dunno if i can buy it and fix it without any coding, is that how it works or it requires coding before fixing in the car, any ideas? I'm fairy certain they're not coded but it might need vairous sensors/features/annoyances configured (probably in PP). How much is it? It might be worth getting for "test by substitution" purposes, you can always sell it on. I saw exactly mine as 18 pounds n ships 3 pounds..so I should just buy it..no coding.. I ddnt c any coding location in pp2000..
Hmm, Service Box is not telling. It does say "part to be configured" though, that could be telling it about sensors, which airbags etc. Perhaps PP has something to say about that? so what do you advice.. i should just go ahead and buy it that way? If they're common around that price I'd say do some more research but if they're rare (that is, if that's the only one) then buy it. I was hoping maybe there was something on the repair manual (there seldom is ) but we had a powercut yesterday and, as well as screwing up the router, it seems to have wiped out my SEDRE and Service Box doc back-up programs for both Pug and Citroen, and I can't get the keygen to work on anything, arse. Anyone? Code is ACZXMAAA .